On one side of President Theodore Roosevelt’s knife is a forest scene with two men behind a tree, one standing with rifle in hand, the other crouching. The top of the handle of President Theodore Roosevelt’s knife is carved in the shape of an eagle’s head of solid gold. The eagle’s eyes are garnets. Theodore Roosevelt in October 1910. A knife presented to President Theodore Roosevelt brought a world record price of $414,000 at auction this past weekend, Sept. 9-11. It is believed to be the most ever paid for an American knife at auction, according to the auctioneer, Rock Island Auction Co. The previous world record price for a knife at auction reportedly was $270,000 in 2006 for a piece that was linked to Sam Houston. Made by J. Russell & Co. of Massachusetts and with an ornate handle of gold and platinum by New York luxury jewelry retailer Dreicer & Co., the knife originally was presented to Roosevelt “to carry with him on his African hunting trip” by James W. Gerard, New York Supreme Court Justice and later ambassador to Germany. The knife was said to have cost $1,250 when it was presented to Roosevelt in 1909, which is about $33,266 in today’s money. The knife had been in the Roosevelt family ever since until this past weekend’s auction. The 6-inch spear-point blade has a mottled gray patina and is etched on the left side with “PRESENTED TO/THEODORE ROOSEVELT/BY HIS FRIEND/JAMES W. GERARD.” The blade mark is J. RUSSELL & CO./GREEN RIVER WORKS. The “T” guard is bear heads sculpted in gold. The sculpted gold handle has a pommel in the shape of a highly detailed eagle head with red garnet eyes. The left side of the handle has a frontier scene on a platinum background. Overall length: 11.5 inches. When Roosevelt died in 1919, the knife became part of the estate of his widow, Edith C. Roosevelt. From there it went to Mrs. Roosevelt’s eldest daughter, Ethel Roosevelt Derby, probably sometime around Mrs. Roosevelt’s death in 1948. In 1976, Mrs. Derby presented it as a gift to the knife’s consignor, who wishes to remain anonymous, as the consignor was about to marry Mrs. Derby’s granddaughter. The consignor and Mrs. Derby’s granddaughter used the knife to cut the cake at their wedding ceremony. In 2013, Stuteville Antiques & Appraisals reportedly valued the knife at a quarter of a million dollars. 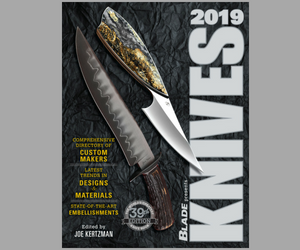 The third edition of BLADE’s Guide to Making Knives gives you all the information you need to start making knives. At less than $20 when you order directly from BLADE, it’s the best investment in your knifemaking career you can make. Pick up your copy of the best knifemaking book under the sun. Previous articleIs a World Ivory Ban in the Offing? I didn’t know the unbelievable price of this knife.But the knife is really nice.Did you saw this kind of knife? I’ve seen knives like this before, yes.